The Fraser Island Defenders Organization has been provided with funding as Project Host as a result of Green Army funding for two projects from the Department of Environment and Heritage. The service provider for these projects will be Conservation Volunteers Australia. The project, Restoring the balance in weed and erosion management on Fraser Island, will commence in late February and again in mid-August and run for 20 weeks. The six participants will range from 17 to 24 years old, and will be provided with training, including Occupational Health and Safety, First Aid, chemical use and the management of small motors. They will gain hands on skills in weed management, erosion control and will be fortunate to have advice and information from the QPWS rangers who will direct the work plan. Site stabilisation through erosion control and weed management on Indian Head (Takky Wooroo). The project provides a unique opportunity to have work carried out on Fraser Island over the period of a year that would possibly take many years otherwise. The team will work with a number of different groups on the island, including the Butchulla people, to learn about the culture and management of the island. The 10th anniversary of FINIA at Dilli Village is also a reminder that sandmining ended on Fraser Island only 39 years ago, after churning up about 200 hectares of dunes. The six-year long Queensland Titanium Mines project was responsible for mining in the narrow coastal strip between North Spit and Dilli Village, an area comprising half that of the total area mined. A further 100 hectares was mined by Dillinghams (after which Dilli Village is named), within two kilometres of Dilli Village to the southwest. This much larger operation, conducted in an area of taller forests and well-developed dunes, lasted one and a half years. Having spent such a turbulent part of my life working to stop the sandmining, I was keen to take a recent opportunity to see how accurate I was in my assessment made 40 years ago of the impact of mining. This excursion, made on 27 October, was an interesting one, as it was the first time for a few years that I have ventured into the areas previously mined by Dillinghams. The reason for my infrequent visits is that the site is unattractive, off the beaten track and difficult to access and move around in, due to the number of dead trees and scratchy branches. My cursory inspection of this area, mined in January 1976, confirmed what I had predicted in the 1970s and what I had previously observed since mining and rehabilitation ceased in 1978. I believe that it will take hundreds if not thousands of years for this disturbed land to recover. First and foremost, the soil has to develop a profile. Fraser Island (Kgari) is known for its remarkable podzolic soils, the profiles of which develop in complexity over time, as do their corresponding plant communities. Dune System 1 (using Cliff Thompson’s criteria) is characterised by no differentiated A and B horizons. No Eucalypts occur naturally on these soils. Some Eucalypts, notably Scribbly Gums and Bloodwoods occur in Dune System 2, where definite A and B horizons can be observed. The further development of these horizons corresponds to increasingly large stands of trees. However, it is usually only on the more established and complex soils, in Dune Systems 3 and 4, that one will find Blackbutts (Eucalyptus pilularis). Developing a soil profile in the mined area is taking much longer than anticipated. This is surprising because in sandblows the transformation from Dune System 1 occurs with relative speed. I can nominate a number of areas that were sandblows less than 40 years ago, but where natural plant succession now includes Eucalypts. However, on the mined areas, the only Eucalypts occurring now were hand planted, and other than wattles, very few plants have volunteered. Of those plant species that grew in this area before mining, only a fraction are now evident, and of these, all occur in much lower numbers (e.g., Phebalium). Wattles seem to dominate, but almost all of the original wattles have succumbed to age and the next generation is much smaller and weaker. I remain amazed at the lack of biodiversity on the mined site. The most interesting observation I made during my expedition regards the development of the Blackbutt trials, established by the Queensland Forestry Department back at the end of 1975. This area adjoins the mined area, but it was not mined. Before clearing to establish the Blackbutt monoculture, this was a Dune System 2. Therefore, the development of the Blackbutt defies the rule that Blackbutt do not occur except in Dune Systems 3 and 4. While I suspect that the facilitator of this surprising growth was the application of fertilizer that accompanied the planting, it is nonetheless interesting that the establishment of this Blackbutt monoculture challenges understandings of where Fraser Island (K’gari) plant communities should occur. The experimental Blackbutt plantation, established by the Queensland Forestry Department in 1975, 40 years later. The area lies adjacent to a mined area, over the hill. Another notable feature of the former Dillingham mine site is the lack of any small understory plants. This applies equally to the Blackbutt plantation. This is particularly noteworthy considering that almost any other forested area on Fraser Island now has an uncomfortably thick understory. This could indicate damage caused to the soils in these areas by sandmining, as well as the disruption of the seedbank, which will affect the recovery of the site. It is fair to say that sandmining had an enormous impact on the integrity of Fraser Island (K’gari)’s soils and plant communities, and that recovery will take significant time and care. Funding applications for state government pest management projects were recently approved for the Great Sandy National Park. 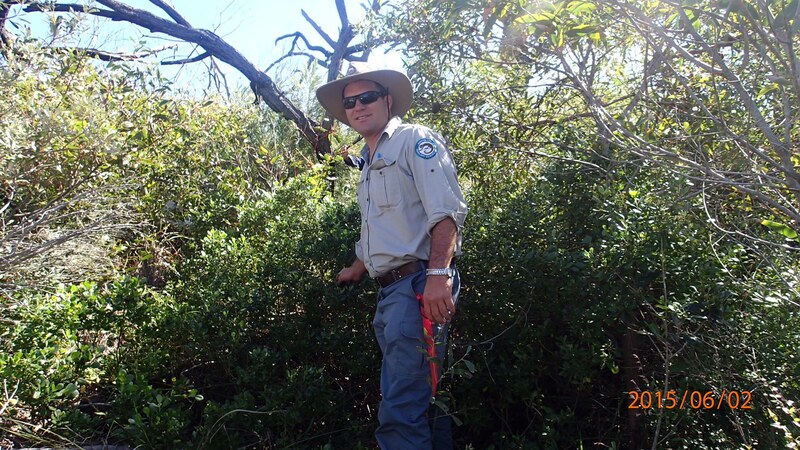 The annual funding for 2015 will assist in the control of a number of priority pest species between Cooloola and Fraser Island that threaten coastal dune vegetation along Australia’s east coast. These species can outcompete and in many cases totally replace native flora by invading undisturbed as well as disturbed areas, and in some cases can create a favourable environment for other highly invasive weeds. Newly funded projects that will add to the work already done by rangers will include a Giant Rat’s-tail Grass Control Program around Central Station, Dundubara and other specific visitor areas, and a Guinea Grass Control Program for the Hook Point Inland road and Cooloola. Cassia around Happy Valley (to continue the collaborative control program). These projects will provide ongoing opportunities for collaboration, as contractors and volunteers will continue to be sought to assist QPWS with this important work. Over 8–11 June, members of the Lower Mary River Land and Catchment Care Group, Don Bradley, Lesley Bradley and Janet Price, treated 160 Pandanus plants at Kingfisher Bay Resort and Beach Front against infestation by Jamella australiae (Pandanus Planthopper). An effort was made to locate all plants at the resort. In addition to the 160 plants treated, 25 plants were found to be infected with Jamella, including three in very poor condition; a further three dead plants were found. 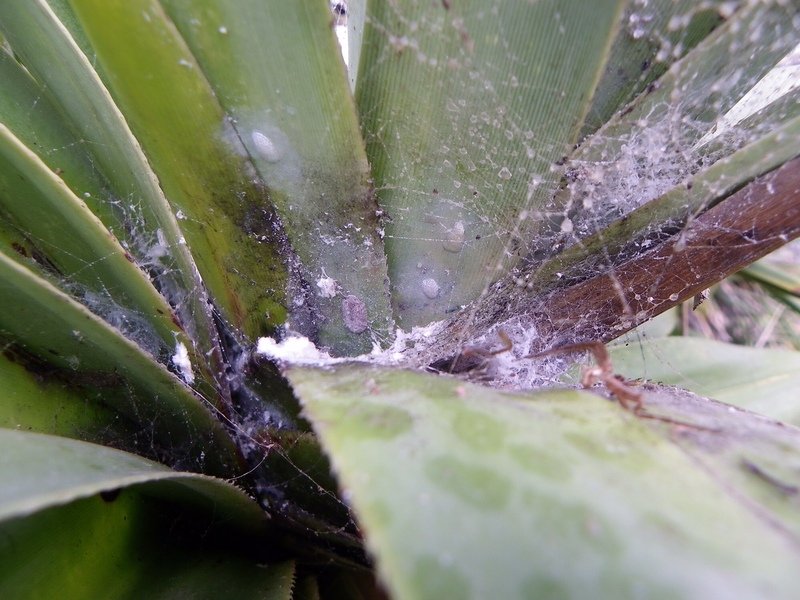 Treatment was with 50% Confidor, and involved injecting trunks and low braches, or in the case of smaller plants, spraying leaves and squirting the crowns. Size of tree and type of branching determined the number of injections per tree: trees head high received one injection; taller, single trunk trees received two injections; trees branching up high received three injections; and large trees branching received two injections per branch where branches could be reached. 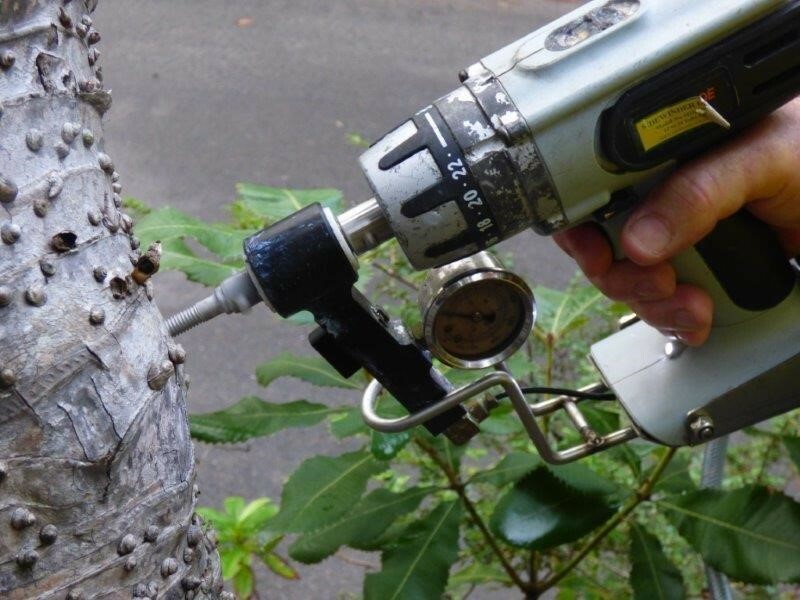 Infected trees were marked with blue paint. Funding for this project was supplied by a BMRG-Chemical grant, and thanks go to QPWS for supplying the Sidewinder tool and training for the injections, and to Kingfisher Bay Resort for providing barge passes and accommodation.